Despite some design flaws and a number of scandals, the iPhone's status as the market leader continues. 29 June 2007: The Jesus Phone, so called because it is the most-hyped brand extension in 2000 years, is launched by its Supreme Creator, Steve Jobs. The first iteration of the iPhone doesn't work perfectly, thanks to some careless design flaws; but, happily, no-one cares. And there's much to admire about what does actually work - particularly its touchscreen and, following the launch of the App Store in 2008, its window on a world of colourful icons. 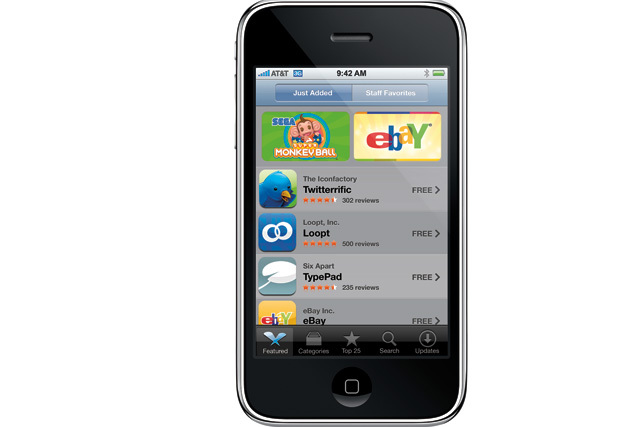 11 July 2008: Apple shows its determination to force the pace when it discontinues the first model and launches the 3G. And the annual increment theme is reinforced in June 2009, when it introduces the 3GS, which promises enhanced access to apps and the internet. The company also posts its best-ever quarterly financial results in its history. 24 June 2010: Apple proves that it is above the rules governing the rest of the business world when it shrugs off a series of scandals - suicides in the factories of its contractors and allegations that these establishments use child workers or force students to work in labour-camp conditions. The Daily Mail runs a piece on one such factory ("the Chinese suicide sweatshop where workers toil in 34-hour shifts"). Apple responds by launching the iPhone 4. 5 October 2011: Following a battle with cancer, Jobs dies. But, days later, Apple continues with its relentless programme, discontinuing the iPhone 4 (which hadn't worked so well as a phone, thanks to some careless design flaws) and launching the 4S. 13 Sept 2012: Now, as night follows day, cometh the iPhone 5, priced at a rather juicy entry level of £529 in the UK. It has a slightly bigger screen, takes slightly sharper pictures and offers slightly faster internet access via 4G - but many technology bloggers say they're somewhat underwhelmed. There are even those, noting the lack of "game-changing" technology here, prepared to argue that this represents an opportunity for rival manufacturers. 1 April 2013: But the competitive reprieve is short-lived. Since the 18th century, manufacturers of analytical engines had always dreamt that, one day, it would be possible to create a machine capable of intelligent and creative thought. Now, Apple unveils such a device, called the aiPhone. Featuring a gold-style finish and retailing at more than £2,000, it does your shopping for you and Tweets three times an hour on your behalf.